I’m not certain, but I think I read that Michelangelo said this quote after sculpting the David. 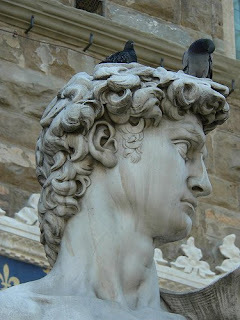 I’ve seen the David with my own eyes in Florence, Italy. I would say anyone that could sculpt such a magnificent piece of art out of marble wouldn’t be one to say that he was still learning. The world is big. The world is wide. I know there is always something to learn. I tend to want the quick learning tools. I took piano lessons for 10 ½ years. My mom dutifully took me to piano lessons once a week for that whole time period. The teachers and professors told my parents, “Your child has talent, but she won’t apply herself.” Witold Turkewicz, a music professor at Samford University in Birmingham, Alabama even went so far as to tell my mom she was wasting her money. To learn, desire has to precede the education. I have to devote myself to what I want to learn today. Today I choose to learn how to open myself up to God’s possibilities. Today, I choose to learn how to better appreciate beauty. Today, I choose to learn how to open my spirit to hear the voice of God.